Zambia : President Lungu returns to Lusaka from the 51st Zambia International Trade Fair in Ndola. 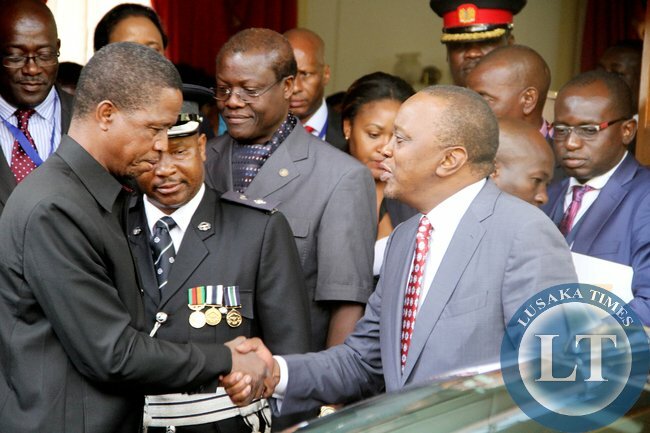 President Lungu returns to Lusaka from the 51st Zambia International Trade Fair in Ndola. President Edgar Lungu has returned to Lusaka after witnessing the official opening of the 51st Zambia International Trade Fair in Ndola. The International Trade Fair was officially opened by his Kenyan counterpart Uhuru Kenyatta who has since left for His country. The Presidential challenger carrying the Republican President touched down Kenneth Kaunda international airport at exactly 17:47hours, this evening. Earlier in the day President Lungu in the company of his Kenyan counterpart President Kenyatta flew to the Copperbelt where the Kenyan President was scheduled to open this year’s international trade fair whose theme was “Prosperity through business reforms and Linkages”. And Kenyan President Uhuru Kenyatta says Trade fairs provide platforms to sample market opportunities and products in order to form linkages that are essential for development. He said Zambia’s and Kenya’s participation in each other’s respective trade affairs provide an opportunity for trade and investment. Mr Kenyatta said at the on going Trade Fair held under the theme: “Prosperity through business reforms and linkages” because of the cordial bilateral relations the two countries enjoy 12 companies from Kenya are exhibiting at the trade fair adding that there is need for trade and investment to be exploited further. He said Kenya and Zambia are committed to removing trade barriers through the cooperation reforms signed by the two countries. The visiting East African President said improved trade and investment will boost economic emancipation and create job opportunities for youths. Mr Kenyatta said it is cardinal that youths are empowered by providing market opportunities for them in order to transform Africa into middle income continent. He said it is encouraging that Zambia has established itself as window to showcase products. He pledged his continued support to the two countries to ensure free and increased trade. And Zambia International Trade Affair Chairperson Emmanuel Hachipuka said there is an increase in the number of companies exhibiting at this year’s trade fair. Mr. Hachipuka said over 501 companies are exhibiting at this years trade fair of which 17 are foreign. Meanwhile President Lungu and his Kenyan counterpart earlier toured selected stands that are exhibiting at this year’s international trade fair. The stands the two leaders visited included Ministry of Agriculture and Livestock, ZICTA, ZESCO and the Zambia Police. Others include the Kenyan and Democratic Republic of Congo stands as well as the PF stand. The two heads of state have since left Ndola. Nothing new here its still poor and getting worse! He can return to Lusaka or Chawama, who cares about his laziness? Since beer is the only abundant commodity in Zambia, it should be used to generate electricity. No more load shedding! Imwe bantu is this news? Where else would he return to? @Prince, Lungu could return to Milpark Clinic for check-up or Mfuwe for retreat. be more grateful that Lungu can return to Lusaka for a short while. Nothing new, as bloggers before me have already said. Same procedure as every year. Anyway, interaction is better that no action at all and let’s hope our president has learnt something from young Kenyatta’s pioneering spirit. Uhuru Kenyatta’s priorities =enhancing trade,fighting corruption and cutting government waste. PF fossil president EL’s priorities= visit many nations,electioneering and running a bloated cabinet. I think in Zambia we need to rent president Uhuru for 5yrs. Hi is already traveled to Malawi on fact finding mission as. apparently, there is no load shedding there. Looking at the two faces though both are serious imbibers, Lungu’s face looks worn out and tired after the tour of the trade fair while Kenyatta’s is still vibrant. Zambia is in serious trouble if we don’t change government in 2016. Illness is written all over Edgar’s face in all frankness. We have seen this before, lets learn from the past or we are doomed for yet another early embassy park gathering. No one mandated to comment on each and every article posted. If you see no sense in a particular story stay away rather that blogging sheet. We are equally not interested to hear from your stewpit rantings. Why is the other man crushing our man’s hand who seems to be wincing. & looking at the live pictures I couldn’t tell who was the host or the visitor. Harry & Ngosa look more like they are the Presidents. Awe ba image team afwilisheni umuntu wesu akweteko confidence. Why is the other man crushing our man’s hand who seems to be wincing. The other man is looking straight into our man’s eyes & our man is looking down & bowing. Awe ba image team afwilisheni umuntu wesu akwateko confidence. Takwaba naumbi eo twa kwata fye.